The return of our all-American indigo herringbone denim. It makes for a classic, substantial workshirt . . . and a great value. This style uses sanforized raw denim from one of the finest mills in the USA. We've come to be huge fans of the herringbone weave. When we found this American version we jumped on it. We love how the herringbone enhances the shade on this style. The warp is a bright, pure indigo blue. It's a few shades lighter than a traditional dark indigo which makes it pair nicely with jeans. A crisp white weft is equally prominent thanks to the herringbone weave and provides great contrast. At 9 ounces you feel protected when you have this shirt on and it can take anything you throw it's way. This is the first of a small cache of American workwear fabric we've found and we couldn't think of a better start. There are a number of construction details that define our workshirt. The first is ample triple needle work with a classic chain stitch runoff. Triple needle is a specialized stitch not found on a standard button downs and that serves as the heart of any good work shirt. Ours gets triple need flat felled yoke and side seams with chain stitched bottoms. We also allow the side seam chain stitch to “runoff” the end giving you three chain stitch ends on each side. We bar tack to ensure the runoff can’t compromise the security of the side seam. The second detail is double chest pockets. We keep ours a bit cleaner, without flaps, but use button closures and double bar tacks in each corner for added strength. The left chest pocket gets the addition of a small pen slot. The third detail is side hem gussets. It’s a small functional element and looks absolutely great. On our selvedge styles we incorporate the selvedge on the bottom. Finally, we love the chin strap. Ours is small enough to be tasteful while still reminding you of the work wear roots of the garment. We created new custom Corozo buttons specifically for our work shirts. They’re a deep navy shade with a slightly domed top and two holes for securing. Overall, this is one of our most intricately constructed garments and one of the most costly to produce. 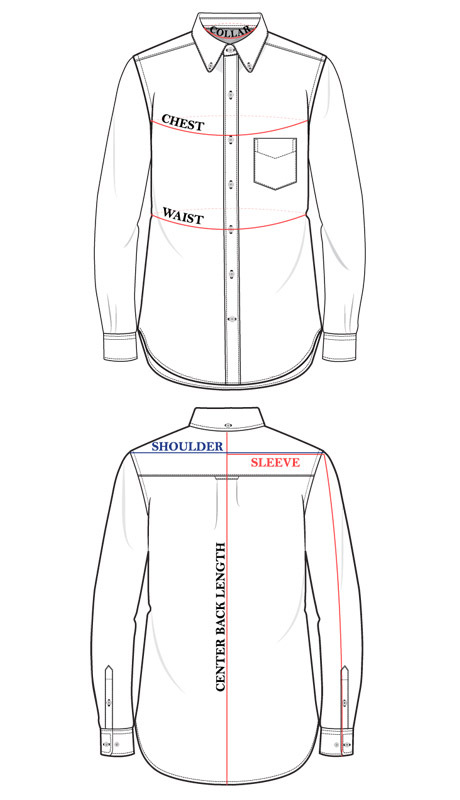 For production on these, we're teaming up with a small shop that exclusively sews reproduction workwear for Japanese brands - always above $300 per shirt. Their work is immaculate, and we're excited to be partnering with them. Our workshirts will be available in our Classic fit and new Slim fit. The Classic fit is essentially our current button down fit. The main difference is in details around construction - no back box pleat, differently shaped side scoops - but the key dimensions in the shoulders, chest and waist are the same. We’ve had a huge volume of requests for a slimmer fitting shirt so we’re please to launch it with the workshirt. We’ll be extending this fit to our standard button downs soon. The Slim fit has a more tailored body as compared to our Classic fit. Chest and waist come in to provide a more fitted option. Details are in our fit guide now.